The recent banning of the plastic bags in several Indian cities has caused people to think for an alternative to the plastic bags . 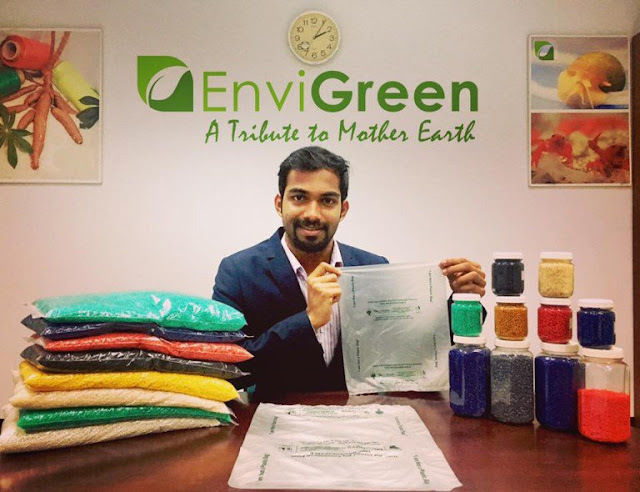 Now a startup , Envigreen, has come up with a solution to the plastic pollution and an alternative to the plastic bags and that is 100% organic, biodegradable and Eco-friendly plastic bags. Also these plastic bags are edible as they are made from combination of natural starch and vegetable oils. 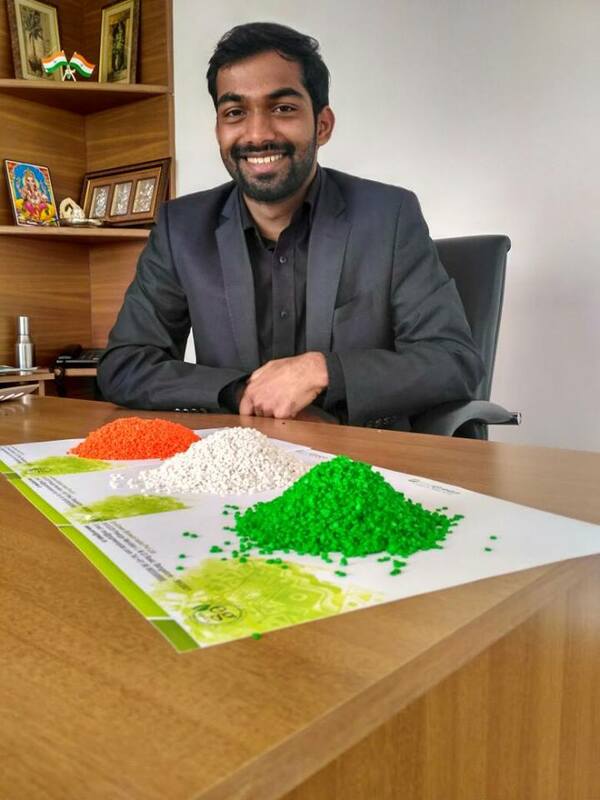 Ashwath Hegde , founder of envigreen , came up with this unique idea after seeing people struggling to find an alternative for the plastic bag , following bans imposed by several Indian cities. According to Hegde “People were concerned bout how they would carry products from the market now. Everyone cannot afford a bag worth Rs. 5 or Rs. 15 to carry a kilogram of sugar,”. So it was after four years of research and experimentation with various materials and in various ways that Hegde found a solution by combination of 12 ingredients, including potato, tapioca, corn, natural starch, vegetable oil, banana, and flower oil, that looked and felt like plastic, but posed none of the environmental problems. Hegde has definitely kept the manufacturing process a guarded secret but he did revealed that the raw materials are converted into liquid form and then taken through a six-stage process to create the edible bags. 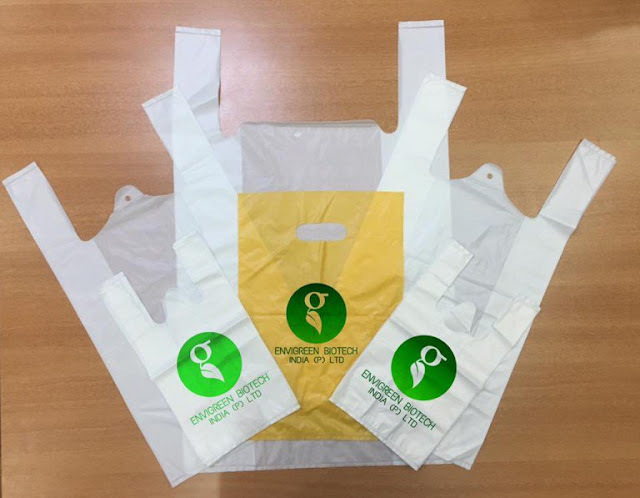 Cost of an envigreen bag is 35% higher than that of a plastic bag but the benefits it has are worth paying for the extra cost. Once discarded, EnviGreen bags biodegrade naturally in less than 180 days, and if placed in water at room temperature, they dissolve in less than a day. For quick disposal, they can be placed in boiling water, and they dissolve in about 15 seconds. Also since the bags are made from natural organic material there's no harm if any animal eats them up as they are already being tested and approved edible. As Hegde said in an interview “We don’t use any chemicals at all. Even the paint used for printing on the bags is natural and organic,” Ashwath boasts. That not only means that users can discard them without hurting the environment, but also that animals can safely ingest them. In fact, EnviGreen “plastic” bags are edible, something that Hedge was more than happy to demonstrate in his interview with . He simply soaked a bag in water and gulped it down with a smile on his face.Also when burnt these bags do not melt and don't release any toxic fumes. Good post. The benefits that are mentioned in the post is really good and very useful. Also use more natural oils like Gingerly Oil Price in Chennai for the natures strong life.